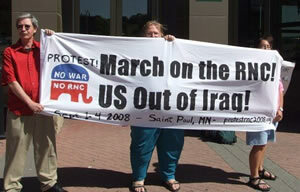 RNC demonstration:	Organizers announce route of anti-war protest | Fight Back! 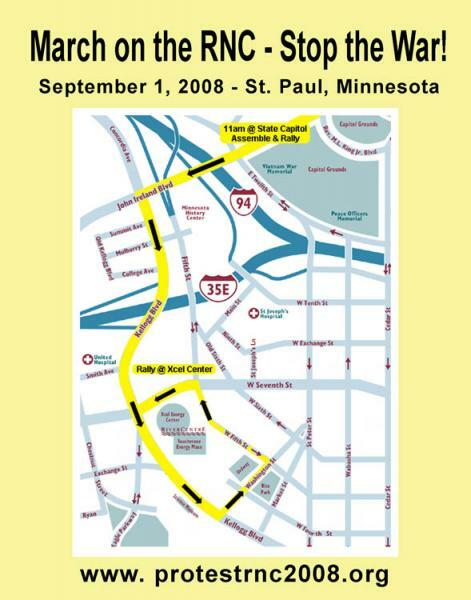 Saint Paul, MN - Local leaders of the Twin Cites peace and justice movement announced their planned march route here at a June 7 press conference. The massive demonstration on Sept. 1, 2008 will coincide with the Republican National Convention. A large map of the march route was displayed. “We are here today to make a formal and public announcement of our plans for a massive rally and march against the war in Iraq,” said Jess Sundin of the twin cities-based Anti-wWr Committee and the Coalition to March on the RNC and Stop the War. “On that day, tens of thousands, possibly hundreds of thousands, from many different organizations and communities, will join together under the banner of the Coalition to March on the RNC and Stop the War. We will demand: U.S. Out of Iraq now; money for human needs, not for war. We will say no to the Republican agenda and demand peace, justice and equality,” Sundin continued. Anti-war leaders have put in applications for permits but city officials are dragging their feet. When pressed, a Saint Paul police official said groups like the Saint Paul Winter Carnival announce their parade routes long before they have permits. 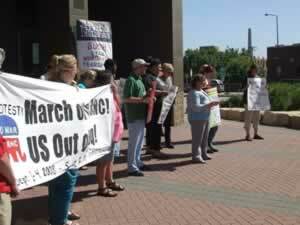 Local activists have decided to do the same. The route of the march has been set. And tens of thousands will follow it to the Xcel Center, the site of the Republican National Convention. “We have a plan. It is a good plan. And we expect the city of St Paul to issue the requested permits,” said Marie Braun of the Twin Cites Peace Campaign-Focus on Iraq and Women Against Military Madness.